Made with a flexible, heavyweight nylon mesh that will hold up to the elements. Great for hot rides and easy cool downs or as a general cleaning aid. 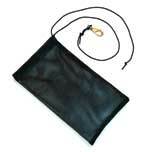 A long, nylon draw-string tie and solid brass clip make for easy attachment to almost any saddle. Large dimensions to fit most sponges - 10"X10". Black only. Sponge sold separately.